This is a 6″x8″ mixed media painting on wood. The sides are painted red and are 1.5″ deep. This painting is $80 and is available HERE. Yesterday, Scarlett was telling me what her day at preschool was like. SCARLETT: We went to the gym and I played super hero with Atticus … no, actually, Atticus was a super villain, not a super hero. ME: Oh, what was his super villain powers? Scarlett: (Looking at me with much pity and disbelief) He didn’t TELL me. ME: Oh right. Well, what was your super power? SCARLETT: ( standing up and putting her right arm in the air) CLEANING! ME: Now that IS a good super power. I love the way kids play super hero. My girls have had their moments, but the desire to be a princess is always stronger. I think that the cape is more of a boy thing. I remember a long time ago, before I even had kids, knowing a woman who had a boy who would not leave his house without his cape. I love that. This entry was posted on January 19, 2011 by mpwynters. 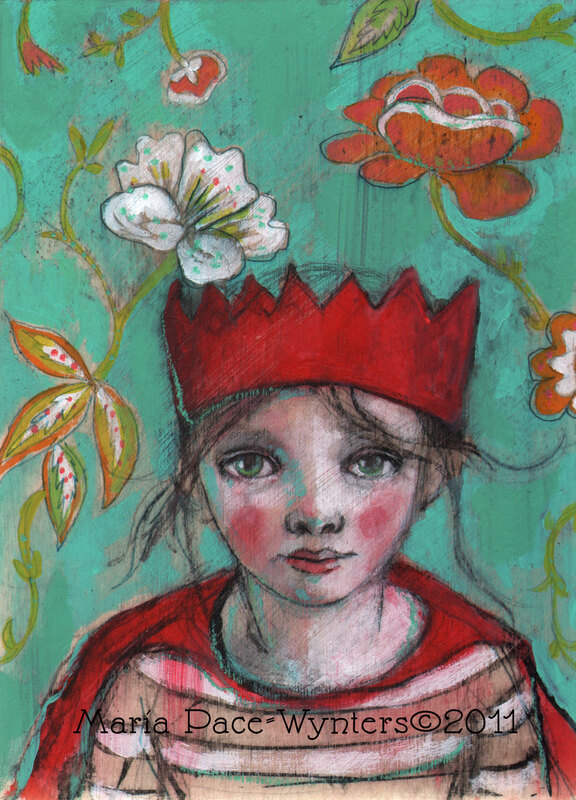 It was filed under Art with Children, bright colours, etsy, flowers, illustration, inspired by children, life, Maria Pace-Wynters, mixed media, original art, Pace-Wynters, Painting, painting for sale, paintings, Uncategorized and was tagged with red cape, Red crown, super hero, super villain.